This tool is destined to : Detector for most packers , cryptors and compilers for PE Files. 2- Add a HexViewer to both the FastScanner & PE Editor plugin. 4- Now The program can scan lnk files. 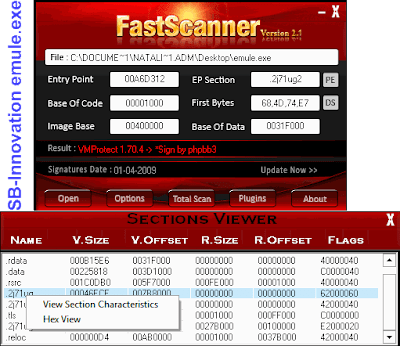 5- Updating the scanning algorithm now the program dsiplay the most matched signature. 6- Put a separator between AT4RE plugins and PEID plugins. 7- Put the (Matches) result in Total Scan dialog. 8- Add HexView and Section Characteristics to the Sections Dilaog. 9- Add Sig Plugin: Fix the Display button and add Sort and Edit Buttons. 10- Add the Stay on top option. 11- Fixed bug in WinUpack-like packed files offset calculation. 12- Fixed bug in viewing disassm dialog and sections dialog. 13- Fixed bug at scanning a DOS file not Windows PE. 14- Fixed bug in detecting Plugins files in Options dialog when renamming FS-exe name. 15- PE Editor : Fixed Bug in Add/Delete Sections. 16- PE Editor : Now you can modify the section characteristics flags. 17- PE Editor : Add Dump Section function. 18- PE Editor : Add HexView button for ImportTable and Resource. 19- PE Editor : Add resource viewer. 20- PE Editor : Add module viewer in the processes tab. 21- PE Editor : Fixed Bug in Imports viewer when there is no imports. 22- PE Editor : Fixed information columns in Processes viewer. 23- PE Editor : Add Icons for Process viewer. P2P eMule Kad vulnerable alert!